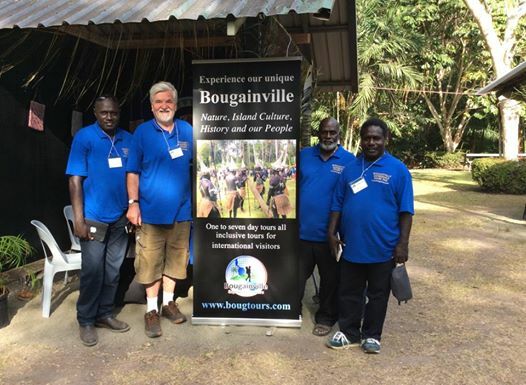 Bougainville continues to attract International cruise ships boosting tourism, economic and cultural opportunities throughout island according to Bougainville tourism operator Zhon Bosco Miriona . Picture at top: Passengers of a cruise ship arriving at the Kuri Resort :130 visited with 24 of them going diving. UPDATE from Lawrence Belleh ABG Tourism CEO : In March 2015 a cruise ship will visit the Queen Karoola Harbour Bougainville .This is the first trip to the old Kesa Plantation that is being considered to be turned into a tourism hub on the Northern tip of Buka Island. The hub would benefit Haku, Halia, Hagogohe, Peit and Tons constituencies and their people. 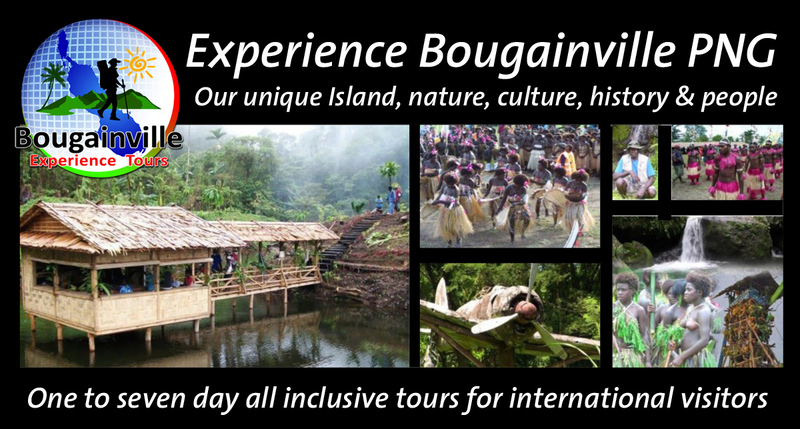 There will be also a visit to Pororan Island to experience the sand, beach, cultural displays (photo above) and the opportunity buy Bougainville souvenirs. Shipping companies are taking an increasing interest in PNG, with passenger arrivals surging and even big ships now heading to PNG’s and Bougainville shores, Brian Johnston reports. The cruise news looks good. According to a report by the Pacific Islands Forum in mid-2013, the cruise industry has grown 125 per cent since 2005 and 143 new ships have been launched. Particularly strong growth has been recorded in the Asian and Australian markets; a record 834,000 Australians took a cruise holiday in 2013. That puts Papua New Guinea in a geographically advantageous position. What’s more, there’s plenty of room for expansion: currently only one in a hundred international cruisers (about 200,000 passengers) visit any Pacific island. 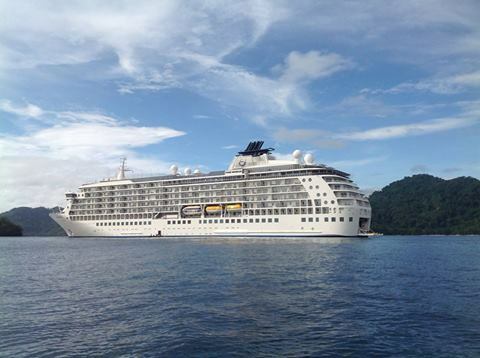 In PNG, only five per cent of holiday arrivals are cruise passengers. ‘Cruise tourism in Papua New Guinea is facing a bright future with increased international interest in cruising and increasing willingness from cruise shipping companies to include Papua New Guinea on Pacific itineraries,’ concluded a recent report from the PNG Tourism Promotion Authority (TPA). The World ( pictured above) arriving last June at Pokpok Island ( pictured above from Simon Pentanu ) , Central Bougainville. 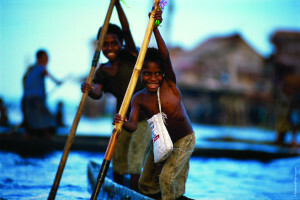 The US, New Zealand, Japan and the UK are significant markets, but half of all cruise visitors to PNG are Australians. That sector is also significant because many cruises are one way, with Australian visitors often extending with land-based holidays. The PNG Government is taking notice. In 2010 it launched its first comprehensive cruise strategy which looked to improving port facilities and opportunities for shore excursions, waiving visa fees for cruise passengers, and reducing pilot fees by half. With expedition cruising already established, the aim was to entice luxury mid-size ships and even big operators. In October 2014, the TPA launched a trade website to educate and inform travel agents. It has also emphasised PNG as a cruise destination in international trade shows and tourism events in Europe, the US and Australia. 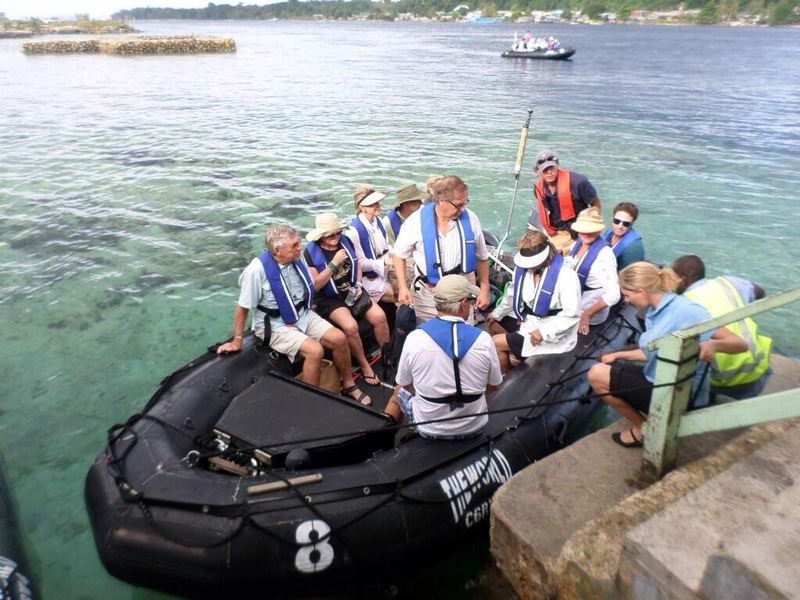 While new jetties have been built in Kitava and Kaibola, among others, Milne Bay became the focus of efforts, since Alotau already had a good port and is well positioned on potential cruise routes from Australia. Wharfs were extended and new public facilities added. 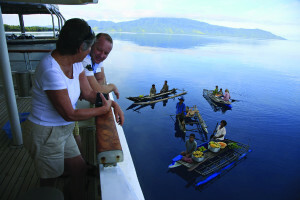 In 2013, the arrival of P&O Cruises’ 2050-passenger Pacific Dawn in Milne Bay showed the strategy delivering results. ‘Pacific Dawn’s entry into the region allowed a new wave of low-cost travellers to see the beauty and thriving culture of PNG at a much lower price point than travel to PNG previously allowed,’ says Stuart Thompson, TPA’s Australia and New Zealand representative. Currently P&O Cruises visits five PNG ports and will add Kavieng and Madang early this year. It has already announced a significant increase in its cruise presence, with its 2015-16 program including its first back-to-back PNG cruises from Cairns, and its first dedicated PNG cruises from Brisbane and Sydney. ‘The addition of two more ships has given us the flexibility to increase our PNG itineraries and open up new destinations. 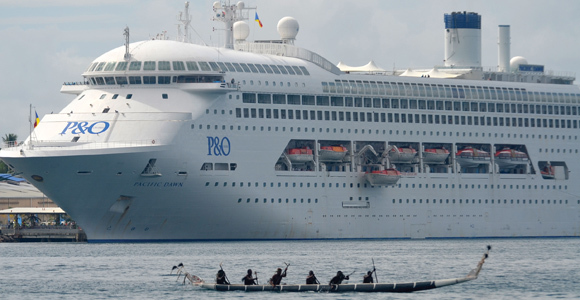 P&O’s return to PNG was possible because of the strong support of the national government and local authorities, particularly in relation to the provision of infrastructure to accommodate cruise ship visits,’ explains P&O Cruises’ CEO Ann Sherry. 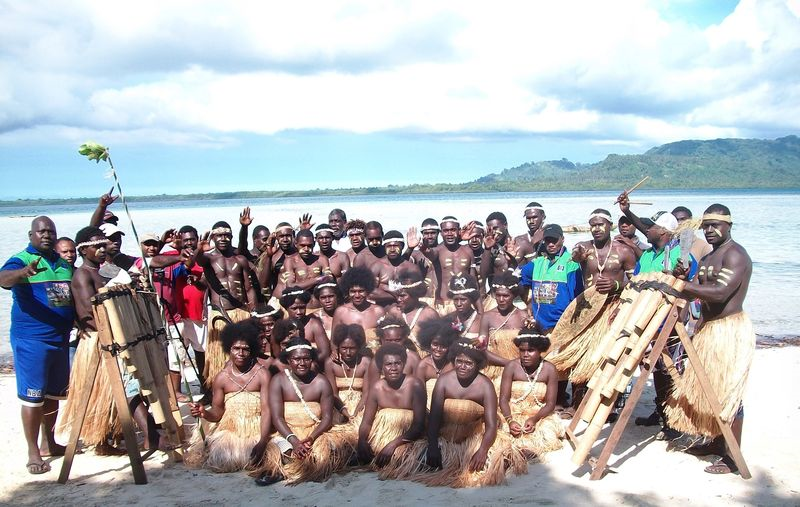 In 2014, Pacific Dawn wasn’t alone in visiting PNG waters. Other visits were made by Japan’s NYK Cruises, Holland-America Line’s Amsterdam, the British ships Black Watch and Caledonian Sky, French Polynesia-based Paul Gauguin, ultra-luxe residential cruise ship The World and three ships from both Hapag-Lloyd and Silversea. Princess Cruises now features PNG across 14 different cruises; it has also added PNG to its 2016 world cruise. Small-size expedition ships continue to have a strong presence, among them Coral Princess Cruises’ Oceanic Discoverer and North Star Cruises’ True North, which carries a helicopter and Zodiac landing boats for access to remote areas. One of its three itineraries focuses on diving the remote Louisiade Archipelago. Aurora Expeditions has a 12-night cruise from Cairns that includes the Trobriand Islands and Tufi fjords. One of the potential benefits of cruising is that it brings visitors to remote areas that cannot otherwise to reached, providing a boost to village economies through the provision of shore excursions, cultural experiences and handicrafts. The TPA says 90 per cent of revenue from coastal tourism operators comes from cruising in some destinations. “Cruising allows a new source of economic income and development which can provide associated benefits in areas such as health, employment and education,” says Stuart Thompson. With the big surge in PNG cruising barely two years old, that remains to be seen, but certainly these are exciting times for cruise tourism in PNG and Bougainville. Watch this space.